The Tutti Designs Store is jammed packed full of all things Christmas and everything Holiday you could ever want or need for the upcoming Season. Check out our SPECTACULAR July Release. 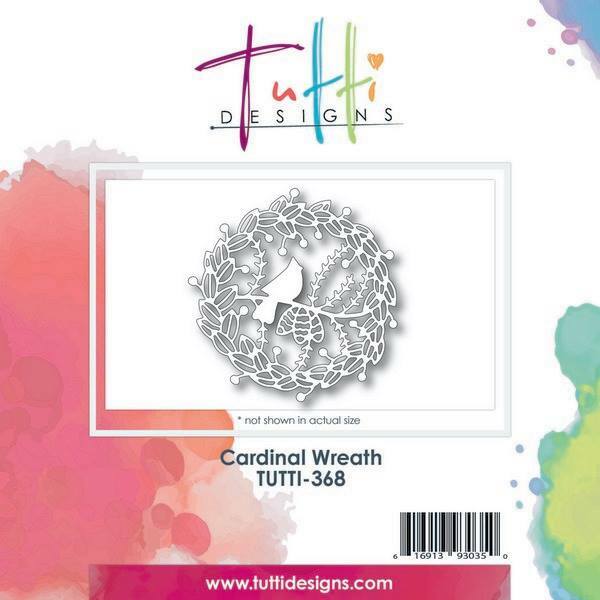 Today I am sharing this amazing Cardinal Wreath. I die cut this magnificent wreath 3 times, twice from white card stock and a third time from a chipboard piece. I layered all three together and then colored with Copic Markers. I covered the complete die cut with some Tombo Liquid Glue and then sprinkled some snowy glitter all over. It really sparkles and shines and gives it that cold frosty winter look I was going for. Stamped my perfect little Holiday sentiment and I was done. The layering definitely adds a bit of oomph! The details and size of this die is awesome. You can create an entire beautiful card front from this one glorious die! Your CAS creation is just gorgeous! Awesome inspiration ... thanks for the details & tips! love the frosted look on the wreath! Peace On Earth, the Tutti way. A Snowman Merry Christmas . . .
A Winters Scene, perfect for Christmas. Angels Rejoice - The King Has Come!